Fresh off finally completing the goal of killing net neutrality protections, Ajit Pai’s Federal Communications Commission is onto its next attempt to destroy longstanding rules that have protected American consumers. According to Bloomberg, the FCC is planning on sneaking in a vote to change limits on how many television stations a single company can own to make way for Sinclair Broadcast Group’s massive takeover of local broadcasting. Per the report, FCC Chairman Ajit Pai intends to schedule a vote on July 12th to alter the current cap on the reach of a single broadcaster. The vote would allow the FCC to get out ahead of the US Court of Appeals, which is currently hearing a case challenging part of the current rules that limit station ownership. The vote would allow the FCC to leapfrog the courts and put its own ruling forward first. The vote would tackle a decades-old rule first introduced in the 1970s that intended to prevent massive media mergers that would allow a single company to control the majority of the airwaves across the country. The regulations set the cap at 39 percent of all households, but Pai is ready to blow that up in order to do a favor for Sinclair, a broadcaster with a conservative bent that has been intent on gobbling up as much control of local markets as possible. Pai hasn’t publicly expressed where he believes the media ownership bar should be, but odds are good it’ll be around 72 percent since that’s how far Sinclair’s reach would become if its proposed $6.6 billion acquisition of Tribune Media is allowed to pass. The merger would allow Sinclair to gain access to 42 new stations and markets, which it could use to blast out its now-infamous “must run” segments like the bizarre promo about “fake news” it forced anchors to read earlier this year. The FCC hasn’t hidden its willingness to be complicit with Sinclair’s rule-breaking takeover of Tribune. 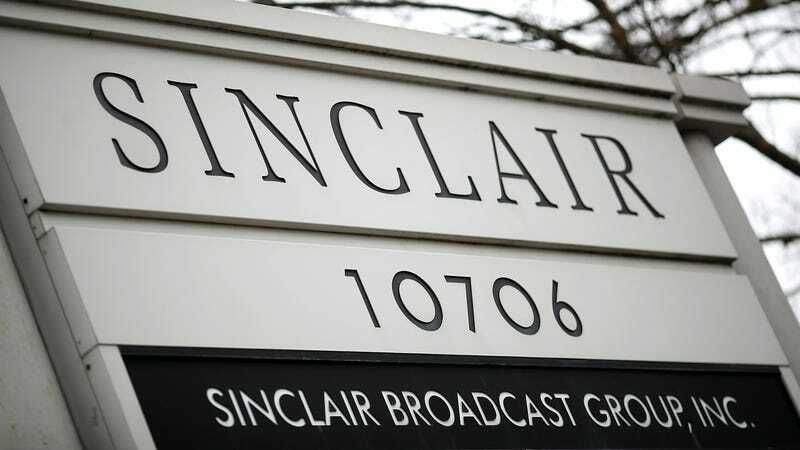 In a statement on the proposed merger, the agency said it is aware the deal would put Sinclair in excess of the FCC’s current restrictions on station ownership, but said the company promised to “take such actions as are necessary to comply with the Commission’s rules to obtain FCC approval of the applications” if the merger is approved. If you are a major corporation, your word is good enough for Chairman Pai—who, by the way, is under investigation by the FCC’s inspector general for ties to Sinclair and the timing of a rule change in April 2017 that benefitted the company. Now with a court decision looming over a challenge to the FCC’s decision to ignore its own rules and approve the Sinclair-Tribune merger—word is the case went poorly for the FCC and the agency is expected to lose when the ruling is handed down in July or August—Pai is ready to change the rules on the fly in order to undermine the challenge. It’s likely that the rule change would garner a legal challenge of its own, Bloomberg reported, but the vote is likely to pass through the Republican-majority agency.